On Monday, November 12, MCCN commissioned Ann Marie T. Brooks, PhD, MBA, RN, FAAN, FACHE, FNAP as president at a Celebration Mass and Commissioning Ceremony in the Medical Staff Building auditorium on the MCCN campus. A reception in the Health Sciences Library immediately followed conclusion of the Mass. Dr. Brooks was commissioned as president after having served as interim since July 2017 and as president since August 2018. Dr. Brooks, who is a recognized international leader, consultant and educator in nursing and health care, will lead the College on its Journey to Transformation, including implementation of a strategic plan to accommodate anticipated growth and campus enhancements. Mount Carmel Health System leadership and MCCN’s Board of Trustees, faculty, staff and students, joined in celebrating Dr. Brooks as she continues to lead the College in providing outstanding undergraduate and graduate nursing education in central Ohio. If you listen closely you may actually hear the sound of jingle bells in the corridors as we all enjoy the celebration of the holidays this month! We begin December by recognizing Hanukkah (Judaism) now through Dec. 10, take note of Bodhi Day (Buddhism) on Dec. 8, highlight Kwanza Dec. 26 to Jan. 1, 2019, and rejoice as we say “Merry Christmas” on Christmas Day, Dec. 25, one of the holiest days of the Christian calendar. Of course, all students are urged to stay focused, and rein in your holiday mindset until after final exams on December 14! Please join your fellow Nightingales in welcoming Dr. Williamson to the MCCN family at a Welcome Reception on January 9, 2019, from 7:30 to 9 a.m. in the College Lounge. It’s that time of year again to celebrate the holiday season with our Franklinton Adopt-a-School friends at neighboring Avondale Elementary School. This is an annual event where gifts from MCCN faculty, staff and students are shared with more than 300 Avondale school students. The event will be held Friday, December 14. Interested in attending? 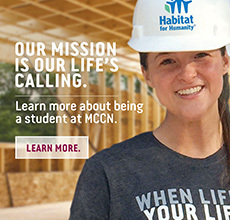 Contact Colleen Cipriani at ccipriani@mccn.edu. Conversion of utilities (electrical power specifically) from Mount Carmel West is done. The CLE third floor door/connector to the hospital is now permanently closed to prepare for both next year’s demolition of the hospital and the creation of the new MCCN IT Data Center and office space for Safety and Security. Expect periodic power outages, primarily on weekends, as the conversion of additional utilities occurs over the next several weeks. The College community will be notified in advance of those outages. Do you have an extra pair of prescription eyeglasses that you no longer wear? The Franklinton Lions Club is collecting glasses to benefit those in need. The box is located in the Mount Carmel Health Sciences Library near the front desk. Kudos to MCCN-Lancaster student Grace Gundlefinger, who organized a 5K fundraiser, "It's a Home Run," to benefit Ronald McDonald House Charities! Now in its second year, Grace, alongside her MCCN family, helped raise money for children's health and well-being worldwide. Lori Hill, MSN, RN, CNP, assistant professor, took first place in the race.